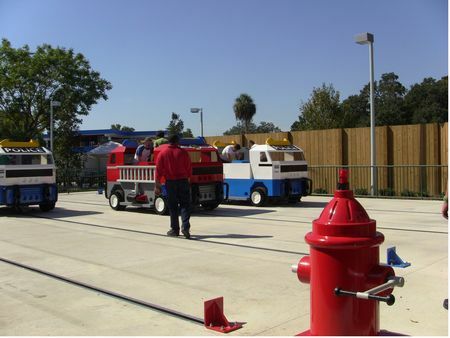 Rescue Academy is an excellent live show in Lego City and one of the best attractions at Legoland Florida. Families (up to four people) compete as teams to drive a giant Lego fire truck down a track, then scramble out to pump water to fight a "fire" with fire hoses. Then it's back into the truck to drive back down the track. First family to complete the challenge wins! Rescue Academy is a physical attraction that's unique in its ability to require participants to work together instead of simply sitting and watching on a ride.